After four rounds of public hearings and intense scrutiny by the Planning and Zoning Commission, a plan to build a three-story, mixed-use development at 16 Cross St. was unanimously approved Tuesday night. The building plans, revised several times during the review process, call for about 7,500 square feet of commercial space on the first floor with residential units on the second and third floors. "We heard the commentary loud and clear on building height, on architectural character, and we came up with a solution that we not only think is appropriate for New Canaan but a nice addition to Cross Street," Kevin Herrick, of the Slam Collaborative, told the commission Tuesday. 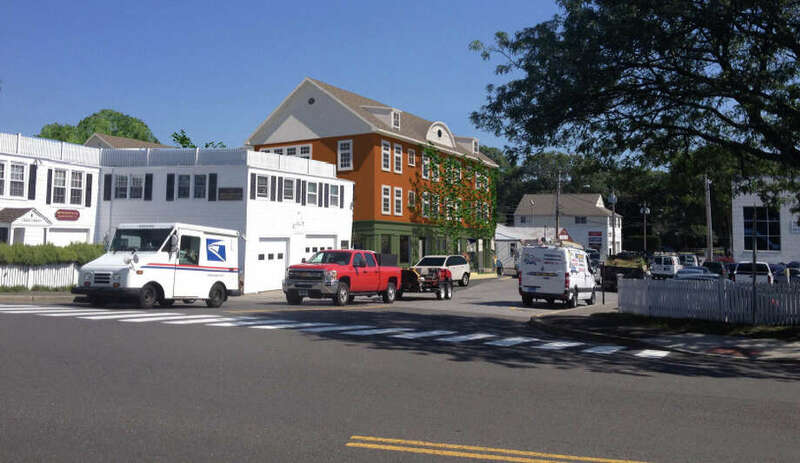 The plan now calls for 10 two-bedroom units and two studios and 54 parking spaces, and about 3,500 square feet would be reserved for an anchor tenant, which the developer hopes to be the New Canaan Post Office. P&Z on Nov. 24 approved requests to amend the town's zoning regulations to accommodate the development -- whose applicant is 3M Capital Trust LLC, led by Arnold Karp, of New Canaan's Karp Associates. Despite the changes, several commissioners were not satisfied with parts of the design. "I think this building is overdesigned for this location," said Laszlo Papp, the P&Z's outgoing chairman. He echoed the feeling expressed by other commissioners who feared the development could set a precedent for the Cross and Vitti streets area. That part of the town largely comprises service-oriented businesses, such as a car wash, a car rental office and an auto-repair shop. Town officials have called it an underappreciated area, where there are large sidewalks and the distance to the train station is fairly short. The recently adopted 2014 Plan of Conservation and Development, a state-mandated 10-year plan that is supposed to guide local growth and development, recommends a re-evaluation of appropriate uses, density and appearance of the Vitti and Cross area. Stephen Finn, a lawyer representing the applicant, urged the commission not to see the development as a precedent-setting for the town. "This is not a paradigm," he said. "You're not setting a precedent with this design no matter how you envision this zone in the future." His point was that commissioners could deny any applications in the future that might resemble his client's if they decide to change the character of the area. Finn argued that the building provides an appropriate transition between the commercial and residential zones in that area of New Canaan. Still, commissioner Kent Turner said the design did not match the "urban fabric" of the area. P&Z Secretary Jean Grzelecki took issue with the proposed peaked façade, saying the peaks were "very sharp." The applicant has already changed the façade design after previous objections from the commission. "I think trying to almost micromanage the design of this building is very, very tough on the applicant," Finn told the commission. The developer will have to return next year with a new façade design.